version of this post appeared on The Last Word on Nothing. 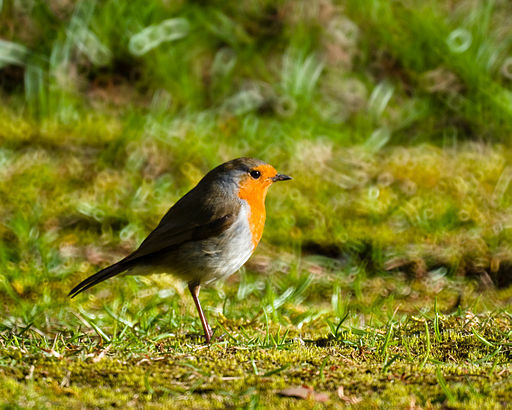 The English robin and the North American robin share a name, but ours is a large, sturdy bird, while the British one is a sweet, fat little bird with a little less red and a pretty dab of gray. In The Secret Garden, the bird that shows Mary Lennox the way into the garden is a robin, and I have always wanted one as a friend myself. The last time I was in Britain, I saw robins often, perched on a fencepost or singing from the top of a bush. I almost always caught myself singing the song “Ah Robin,” which we sang in the 2007 Christmas Revels. I suspect this song is about a man named Robert, not a bird, but it came to mind anyway. Swallows streaked by at fence-level, wings swept back like tiny fighter jets. “Bring back the roses to the dells/The swallow from her distant clime/The honeybee from drowsy cells,” I sang to myself. The ecosystem I know best is that of the Washington area; I know what our swallows and robins are like. But a lot of the songs we sing in Revels were originally about spring and landscapes that have been farmed intensively for centuries, in a country on the other side of the sea. For the first time, I was seeing all of these birds in the ecological context where the songs were born, where my distant British ancestors might have seen them. By the way: England’s blackbird is a thrush, a different family from our creaking New World blackbirds. They sing from the bushes, too, and can only bring to mind one song. Buy your Christmas Revels tickets now. Much of what we do at Washington Revels is rooted in the seasons. Spring is the star of our May Revels. During the hot days of summer, we march and sing in local parades. In our after-school workshops, children explore how people down the ages have interpreted the seasons in music, dance and drama. Usually, in the Christmas Revels, we visit one or more specific cultures and eras, exploring how people in different places and times have celebrated the end of the old year and the beginning of the new. Nature is present primarily as a backdrop to rural life. This year, nature comes to the forefront, as we explore our relationship with the natural world. The time period is less defined than usual, over a thousand years ago, in the Middle Ages. Back then, it was hard to escape our planet’s physics. When the world was cold and dark, we were cold and dark. Nearly everyone had to think about plants and pests, and whether the chickens would stop laying or the river would flood. Today, some of us are still closely tied to the physical world. There’s a farmer in our chorus, for example. But many of us might think we can wall ourselves off from nature. Convenience stores will sell us eggs at any hour of the day or night. We have concrete, insulation, and elevators. We are still part of this planet, though. Life feels different when the sun sets so early. Our city can shut down for days if the wrong set of air masses happens to collide over us. 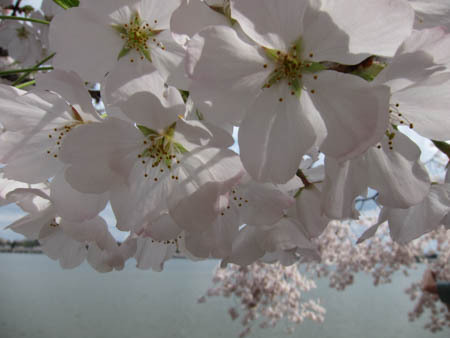 As we come together this weekend—whether on one of Washington’s oddly warm December days or whether the snow has begun—let’s sing together of peace and warmth, and look forward to when the sun comes back, the forsythia bloom, and the cherry trees let their clouds of petals fly. A version of this essay appears in this year’s Christmas Revels program. That’s a line from “Please to See the King,” a song in this year’s Christmas Revels. I’ve been singing in the Christmas Revels chorus since 2004. Being involved with Revels has changed a lot about my world. It has brought me beloved friends, fulfilling performances, and connection with strangers, in the Christmas Revels and other events through the year. It has also made me think more about my relationship with nature. Living in the city, like I do, it’s easy to ignore the natural world. But almost everything we do in Revels relates to the seasons. As the days get shorter and winter approaches, I treasure the weekly opportunity to sing and dance with my village, the Christmas Revels chorus. Then, in summer, I get to sing about the joys of the growing season, instead of cursing the humidity. “Please to See the King” is one of many songs that make me think of the British countryside. In this case, it’s quite a direct connection: the landscape of much of Britain is crisscrossed with hedges. They’re practical, living fences. If properly maintained, they’re dense enough to keep livestock in the correct pasture. Gates and stiles are built into gaps in the hedges so people and dogs can pass through. In July 2013, my friend Kate and I spent a week walking through the Cotswolds, a lovely patch of England that is particularly pastoral. 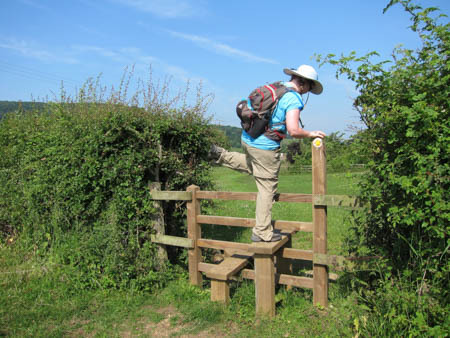 We walked along a lot of hedges and climbed over a lot of stiles. This was the first one.